Research articles published by Prabhakar Clement and Joel Hayworth, faculty members in Auburn’s Department of Civil Engineering, and their graduate students Fang Yin and Gerald John, show that the Deepwater Horizon disaster continues to impact the Alabama beach system. These articles appeared this month in Elsevier journals' Marine Pollution Bulletin and Science of the Total Environment. When the Deepwater Horizon oil rig exploded in April 2010, it killed 11 workers and released millions of gallons of oil into the Gulf of Mexico. Now, four years later, the Auburn University researchers are finding that oil remains trapped in the shoreline, mainly as tar balls. Since June 2010, the research team has been documenting the impacts the oil spill has had on Alabama’s beaches and nearshore environment. The data gathered on the physical, environmental and ecological conditions of these beaches is vital to better understand the consequences of the oil spill on Alabama’s beach system. 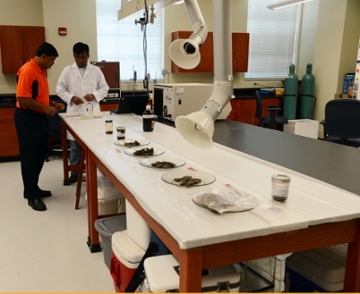 The team uses field samples including the first oil collected from Perdido Bay, Ala., in June 2010 as well as multiple samples collected until August 2014. In their newest study, Clement and Hayworth published data revealing that concentration levels of several heavy polycyclic aromatic hydrocarbonds (PAHs) have remained constant over the past four years. Currently, the long-term consequences of the spill are not fully understood; however, one of the team’s articles reports the possibility of long-term environmental risks from exposing coastal organisms to several toxic PAHs that are not degrading. The second article reports that background tarball activity has increased in Alabama’s beach system after the oil spill and it is unlikely these beaches will return to pre-spill background conditions in the foreseeable future. Clement and Hayworth’s team works closely with the coastal communities of Orange Beach and Gulf Shores. The present and future physical, environmental and ecological conditions of these beaches are of vital importance to these communities, which are heavily dependent on beach tourism. The team’s latest findings show that the oil is likely to remain in the beach system for several years. View the team's research papers here and here.